Gut health is a hot topic these days. When I first started studying nutrition more than 10 years ago, we learned the basics of probiotics and prebiotics, but overall it was a minuscule part of the curriculum. Now “gut health” is a term being widely used, and supplements are popping up everywhere that claim to optimize people’s gut flora. It’s become normal to talk about our digestion, absorption, and excretion (aka our poop) with friends, family, and Instagram followers- a topic which was pretty taboo back in the day. But what does a healthy gut even look like? And what does it take to get there? With all the supplements available on the market, it can be overwhelming to know where to start. If you’ve been following my page for a while, you’ll know that I’m a fan of real food more than supplements. Lately I’ve been choosing Lifeway kefir to get my daily probiotic dose, in addition to other cultured/fermented foods and prebiotics from a mostly plant-based diet. Above are two of Lifeway’s unflavored versions, however they are also available in a variety of flavors and fat content. Gut health is so much more than your poop (although that is a big part of it!). Over half of the cells that make up our immune systems live in our intestines, which means that a healthy gut could help you get sick less. Who doesn’t want that?! There is a connection between our guts and our brains, aptly named the “gut brain axis”. This means that the bacteria that live in our intestines are communicating with our brains, so these little microorganisms actually play a role in our mood and mental health. Research even shows that a healthy proportion of gut bacteria may promote improvements in conditions such as anxiety and depression. And of course, there’s the digestive and absorptive benefits. For the average person, a healthy gut might mean staying regular on a day-to-day basis, but even those with more aggressive bowel issues such as IBS can benefit from consumption of probiotic rich foods. The “Champagne of Dairy” supports immunity and healthy digestion. What can we do to optimize our gut health? We have billions of bacteria that live in our intestines, but the ratio of good to bad can shift depending on our genetics, diet, medications, and several other factors. We might not be able to control our genes, but we can certainly control our diets. Foods that contain probiotics (the good bacteria!) include cultured dairy products and fermented foods. Kefir is a tart and tangy cultured milk drink, similar to a smoothie in consistency. It does share some nutritional similarities with yogurt, however the probiotic content and diversity is even higher – up to 2-3 times more, comparatively! My favorite brand of kefir is Lifeway, who makes several flavors and varieties of this probiotic powerhouse drink. It’s available in full fat and low fat, plain and flavored, no added sugar available – all in several different sizes. Their products are pasteurized, which means they’re safe for immunocompromised individuals and during pregnancy. Lifeway kefir has 12 different strands of probiotics, which is helpful because it’s been shown that variety is key to gut health. I love adding kefir to my oatmeal and I’ll be sharing more ways to use kefir over the next few months. Some of their flavors are so delicious that I honestly just pour myself a glass and drink it - like their lemon meringue. 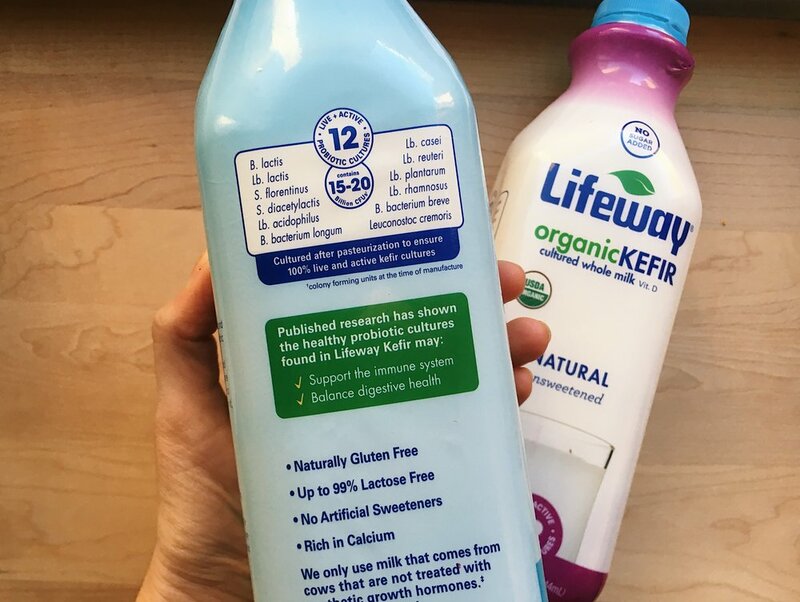 Lifeway kefir is also up to 99% lactose free, which means that it’s a suitable option even for those with lactose intolerance. The lactose is partially digested by the good bacteria found in the kefir, which means you can enjoy dairy without the gassy/bloaty side effects. Lifeway kefir has 12 live active cultures.